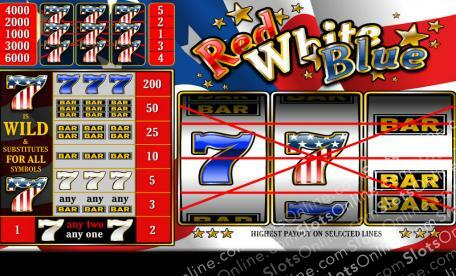 Solute the flag in this patriotic slots game that features red, white, blue and plenty of green! Click here to play! The top symbol in this slots game is the stars n' stripes seven. It will not only substitute for all other symbols, but it will bring in a top prize of 6000 credits if you spin three of them across the single pay line. Blue sevens also pay out as well. Three of these will get you 600 credits. You can't have a 3 reel game without BARS. There are triple, double and single BARS that will bring in 150, 75 or 30 credits respectively. White sevens will also help you in your quest for cash, bringing in up to 15 credits for three across the pay line. There are a couple of other combinations to help you spin in more wins. Don't forget to bet the maximum of three coins to activate the highest pay table and bring in the biggest wins. So, spin in the red, white and blue to bring in all of the green! The stars n' stripes seven will substitute for all other symbols, which will help you bring in more money!